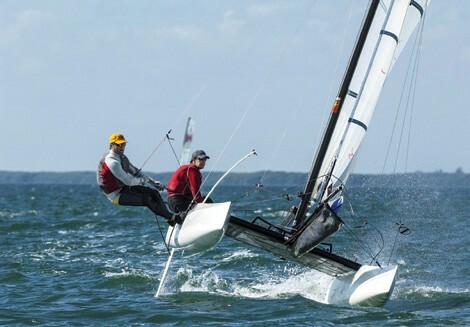 The Roton Point Sailing Association in Rowayton, CT is hosting the 56th Annual Roton Point Multihull Regatta on September 18-20, 2015. An open regatta sanctioned by the New England Catamaran Sailing Association, the event is sponsored by Gosling Brothers, Ltd. of Bermuda and their world famous Black Seal Rum. Registration opens at noon on Friday, September 18, with hors d’ouerves and an open Gosling’s Rum and beer bar at 2:00. Racing starts on Saturday, followed by a beach party with live music, a steak dinner and open bar. Sunday’s racing precedes the All Hands awards ceremony, corn chowder and another open bar. “There’s nothing like the Roton Point Multihull Regatta,” said RPSA Commodore Charlie Janson.” Sailors, catamarans, fair winds, great food, entertainment and multihull history* – it all comes together at Roton Point every September. We hope you’ll join us this year!” More information, Notice of Race, and online registration may be found at rpmr.org. * The Roton Point Sailing Association hosted the International Catamaran Challenge Trophy, a match race series for 25-foot C-Class cats better known as the Little America’s Cup, in 1977, 1980, ’82 and ’85.